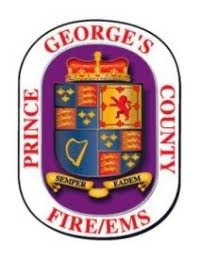 Several members of the Prince George's County Fire/EMS Department were recognized for their actions on recent incidents. On the afternoon of Friday, April 22, 2016, Retired Lieutenant Colonel Tyrone Wells and Assistant Fire Chief Darren Ware were in the area of Crain Highway (Route 301) and Brandywine Road when they observed a car on fire. Upon stopping to provide assistance, Assistant Chief Ware ran to the vehicle and discovered the female driver still inside. He attempted but could not to open the door, and the woman was unable to respond to his instructions to unlock the door. At that time, Tyrone Wells, assisted by an unidentified citizen, used a heavy hand tool to break the rear window on the driver side and the passenger side front window. During the initial extrication attempt, the driver, who appeared to be suffering from a medical condition, had pushed on the accelerator. This caused her vehicle to move forward and further down an embankment, preventing access from the driver side. Chief Ware and the citizen pulled the woman through the passenger side window and carried her up the embankment and away from the burning vehicle. Fortunately, she did not incur any injuries from the accident but was transported to the hospital for suffering from an unknown medical emergency. Greenbelt Volunteer EMS Sergeant Ashley Kozlowski received her Emergency Services Award for stopping and providing EMS assistance to the female pulled from the vehicle. 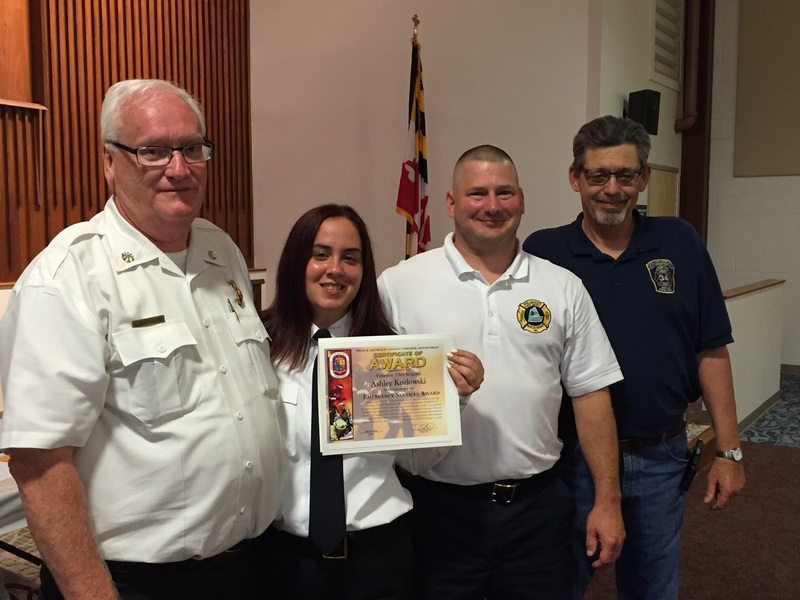 She was presented her award by Deputy Fire Chief Jim McClellan along with Greenbelt Volunteer Chief Tommy Ray and Association President Chuck Walker at the Prince George's County Volunteer Fire and Rescue Association meeting in Laurel on Wednesday, July 13. While presenting the Emergency Services Awards, Fire Chief Marc Bashoor/Deputy Fire Chief McClelland stated, "Your performance on the scene of this incident saved the victim’s life and is commendable and worthy of recognition. 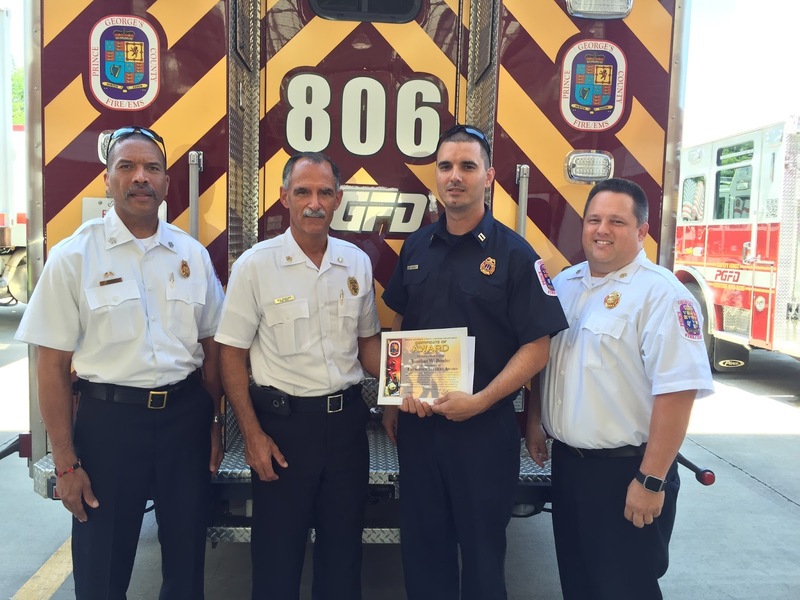 Therefore, you are hereby awarded a Fire/EMS Department Emergency Services Award. Your actions reflect well on you both personally and professionally and exemplify the excellent caliber of service we strive to provide to the residents of Prince George’s County." 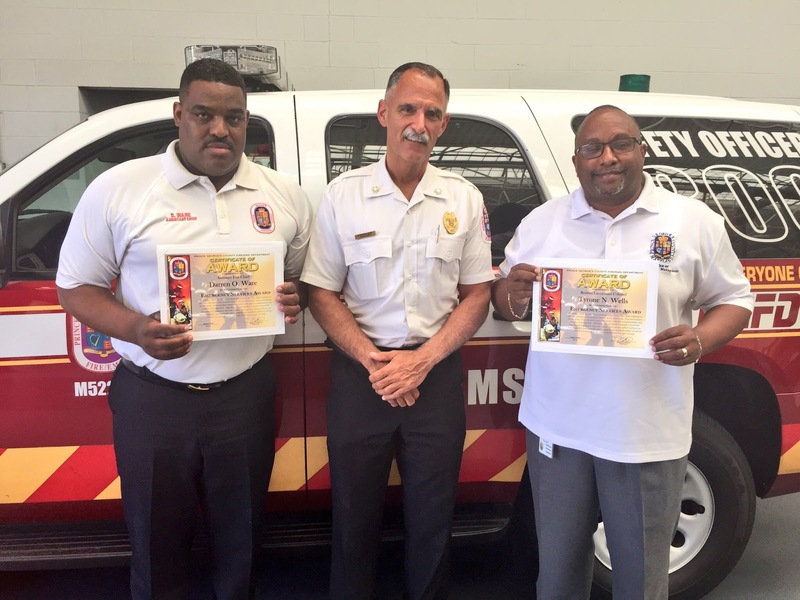 Chief Deputy Ben Barksdale, Fire Chief Bashoor, Captain Jonathan Bender and Deputy Fire Chief Dennis Wood. The crew from St. Joes Fire/EMS Station 806 were recognized for their efforts on an incident on the Beltway. While working on the extrication and packaging of a crash victim the crew had to quickly transition to a secondary crash that critically injured a trapped civilian driver. Fire Fighter/ Medic Captain Jonathan Bender accepted the Emergency Services Awards on behalf of the rest of the crew which included Fire Fighter Brian Brady, Fire Fighter Andrew Breen, Fire Fighter Alexandria Myers, Fire Fighter Patrick Maloney, and Fire Fighter Bryan Wilson.